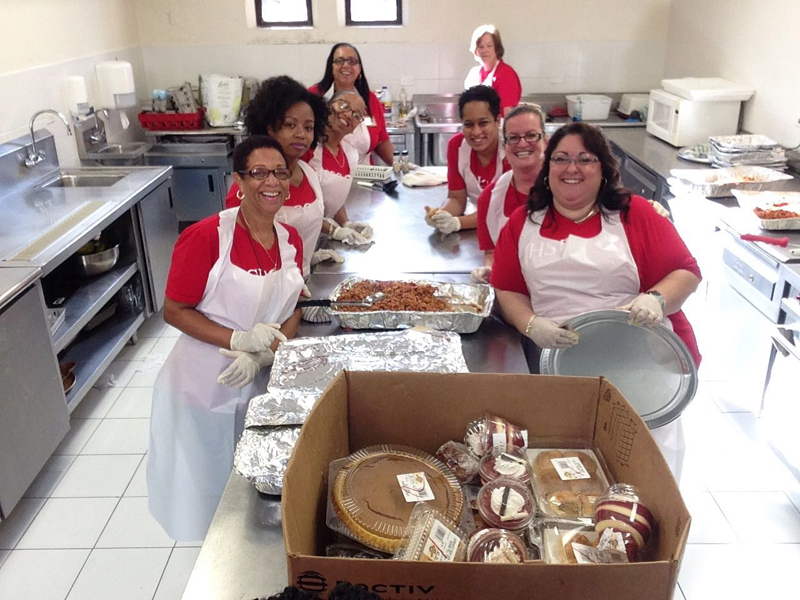 In partnership with the Eliza DoLittle Society [TEDS], the Anglican Cathedral and the Salvation Army, the staff of HSBC rolled up their sleeves in an effort to address the issue of hunger in Bermuda. From October 2016 through to February 2017, the Bank launched its first bank-wide, team based volunteering programme comprising of 10 – 15 employees per team. 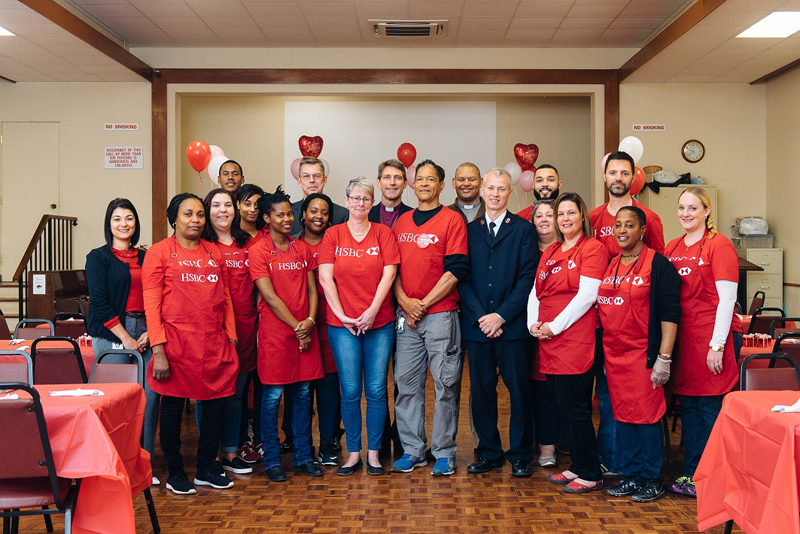 Between 9am – 12pm on Tuesdays and Wednesdays of each week, one HSBC team of volunteers cooked and prepared meals which were subsequently served by two other HSBC teams of volunteers, to those in need at either the Salvation Army or Anglican Cathedral locations. The concept for this initiative evolved from HSBC’s discussions with TEDS where a need in the community for additional morning feeding programmes was identified. Thanks to the additional HSBC resources and the partnership with TEDS, the Anglican Cathedral has been able to add Tuesday and Wednesday mornings to their regular Monday and Thursday sessions. 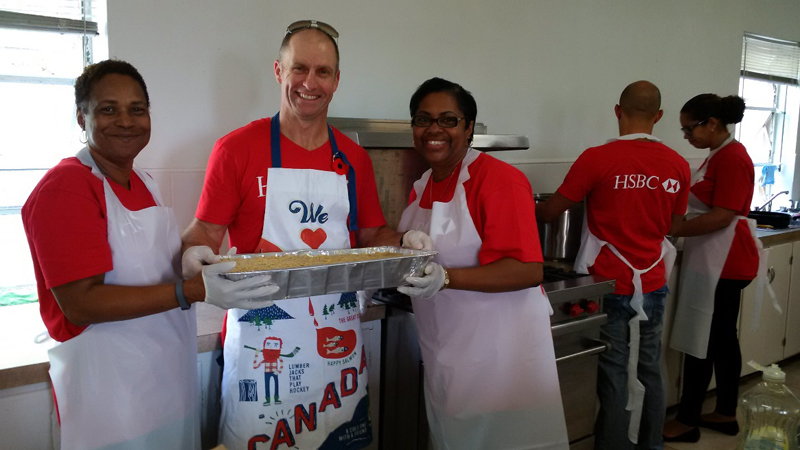 Mark Watkinson, CEO, HSBC Bermuda said: “This volunteering initiative was three-fold. It identified and addressed a need in our community; it allowed the Bank to strengthen its relationships with its third sector partners; and offered our entire workforce the opportunity to get out the office for some fun and meaningful team-building. Clesia Pachai, Community Investment Manager, HSBC Bermuda shared, “Over the programme’s four month duration, Bank personnel contributed over 1,200 volunteer hours towards this initiative and through successful collaboration with its charitable partners, were able to provide a hot meal to an estimated 1,100 members of our community. Jennifer Mahoney, Executive Director, The Eliza DoLittle Society added,” It has been an absolute pleasure to work alongside the management and staff of HSBC on this very important initiative. “The HSBC teams really rose to the challenge by exhibiting enthusiasm, empathy and many going the extra mile to make the meals memorable for the clients. “The programme has enabled us to reach hundreds of HBSC employees and educate them on what our organization does, how we impact the community, and how they can help further if they are so inclined. What a great programme- Mr. Terry Battersby is a wonderful asset to Bermuda and one of the reasons the Daily Bread feeding programme is so successful. Keep up your good work Mr. Battersby! It is wonderful to see this picture of yet another group helping out in Bermuda during a time when so many of our people are suffering.